Angrboda was a Jotunn witch who sowed seeds of discord wherever she went. She was responsible for provoking the lust for gold, and cheating and murders in Midgard. Acting on behalf of the Jotunns who desired to destroy the Aesir and Vanir, she had used her trickery to create a vast divide between the two. She was eventually discovered and burned for her actions, but she was not so easily destroyed. Her body burned away, but her heart did not. From these remains, Angrboda was able to resurrect herself in entirety. As long as her heart was intact, she could continue to revivify. The executors promptly attempted to burn the witch a second and third time, but each time, she resurrected, burned, and the heart remained. Loki saw that this game would go on forever if they did not dispose of the heart, so before Angrboda could resurrect again, Loki rushed forward, pulled the heart from the flames, and swallowed it. But even with that, Angrboda’s evil was not completely destroyed. 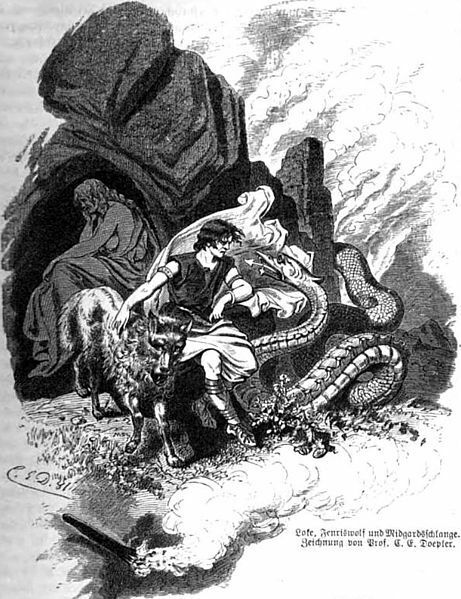 From the heart he had swallowed, Loki gave birth to three beings: Fenriswulf, Midgardsormr (or Jormungandr, as it was called by the Jotunn), and Hela. Fenriswulf, a large grey wolf, would go on to bite off the hand of the battle god Tyr, herald the beginning of Ragnarok by escaping his bonds, and destroy Odin in the final battle. Midgardrsormr was a serpent who would grow so large he encircled the world, and in the final battle he would destroy the mighty Thor. Hela, a normal woman on one half of her body and a corpse on the other, was the only one of the three who was not destined for evil. She would go on to become caretaker for the dead who were not killed gloriously in battle, in the realm of Niflheim. Angrboda’s evil also persisted in the tension she had introduced between the Aesir and Vanir. Despite her death, her actions still resulted in a war between the two. In this way, Angrboda had succeeded. And if people keep wondering, IT IS NOT GULVEIG’S HEART that Loki ate. Gulveig isn’t Angrboda either. Gulveig burned and became Heidr ( her burning was a sacrificial rite) Gulveig is not Freya either, Reading the Eddas, you discover that plenty of witches and jotunn were burned. Whether for the hell of it or because they had to. Tyr: My hand do I lack, | but Hrothvitnir thou, And the loss brings longing to both; Ill fares the wolf | who shall ever await. In fetters the fall of the gods. Cats and other Viking Age pets. The Vikings kept cats for their valuable skills as mousers as well as keeping cats for pets. Kittens were sometimes given to new brides as an essential part of setting up a new household. It is especially appropriate that brides should receive cats, since cats were associated with Freyja, the goddess of love. The Vikings believed that Freyja rode a cart drawn by a team of cats. It might seem absurd to imagine a cart drawn by cats, until one realizes that Viking cats were not your standard Felis domesticus — they were the Skogkatt (Norwegian, meaning literally “Forest Cat”), a wild breed native to the North. In Denmark, these cats are called Huldrekat (huldre are female forest spirits, literally, “the hidden folk”). The Skogkatt is a large breed, known for their strong bones and muscular forms. The birth-mother of Fenrir, Hel, and Jormungandr is, for the most part, said to be Angrboda, with Loki as the father. I disagree with this claim, and believe Loki to be the birth-mother. There is support for both the former and latter, but that point is not made clear enough in our surviving sources to make a proper conclusion. The idea of Angrboda as mother of the brood has merit in its simplicity. Most people assume the female to be the mother, and the male to be the father. Angrboda is female, Loki is male. The mother/father is not explicitly stated, so perhaps the simplest explanation should be assumed. This claim also tends to go hand-in-hand with the assertion that Angrboda is Loki’s mistress or other wife in Jotunheimr, but this seems completely unfounded to me. There is really no evidence of a relationship having ever existed between the two, or that they even knew one another. I suppose Loki’s self-professed promiscuity could explain him fathering children with a completely arbitrary woman, but casting Angrboda as Loki’s wife seems to be too lazy an assumption. 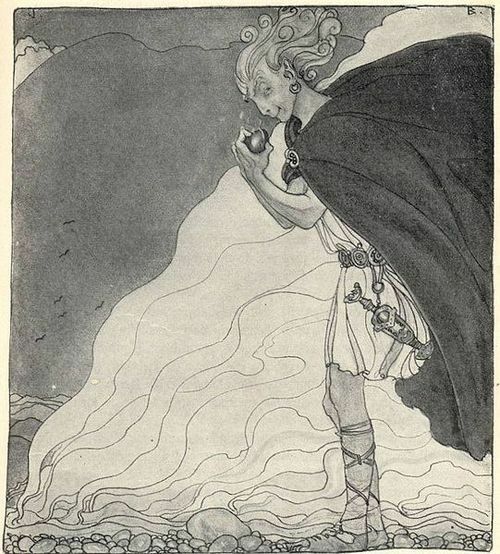 The incident on which Loki eats a woman’s heart comes from Hyndluljod, a source more dated than Snorri, in the Poetic Edda; as such, I feel the references therein are more accurate to authentic Norse mythology. The account is incredibly vague, and all that is revealed is that Loki eats the half-cooked heart of an “evil woman” that he takes from the embers. He becomes pregnant from this, and gives birth to “the monsters” (flagð). It is not made clear to which “evil woman” the heart belongs, or to what beings “the monsters” refers. “The monsters” may refer to Fenrir, Jormungandr, and Hel – they are indeed the most suited for the title, among Loki’s other offspring. These three “monsters” are usually attributed to the union of Angrboda and Loki, so if it is assumed these three are “the monsters”, then it must also be assumed that the heart belonged to Angrboda. 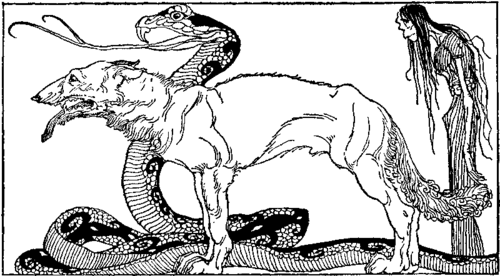 One section of Hyndluljod states that Loki gained the wolf (Fenrir) by Angrboda, which may imply that it was Loki impregnated by Angrboda. The heart that Loki ate is a mystery all on its own, and its origins should be considered before attributing it to Angrboda. It came from an “evil woman”, Loki took it from the embers, and it was half-cooked. The Voluspa, another entry in the Poetic Edda, mentions the Aesir-Vanir war, which came about when an “evil woman” named Gullveig was thrust with spears and burned by the Aesir in Odin’s hall. We are told she was burnt and reborn three times over, and even that was not enough to destroy her. Perhaps a half-cooked heart remained, and this was the one Loki ate? Angrboda’s heart was said to be frozen like the sea spray, so this may be why the heart did not burn when the rest of the body did. Loki’s reason for eating the heart may have been to prevent further resurrection, which is very similar to Loki’s countless outlandish solutions to unsolvable problems facing the Aesir. There is a great deal of evidence, although still not fully accepted, that Gullveig and Angrboda are one and the same. I’ll go into Angrboda/Gullveig/Heid in detail in a later post – I need to answer your question first and foremost, and if I start talking about Angrboda, I’ll never get around to it. Angrboda is written as Aurboda in Svipdagsmal, which gives the name the exact same meaning as Gullveig. “Aur” and “Gull” both mean gold, and “boda” and “veig” both refer to a strong alcoholic drink. From the above, although there is no concrete proof, there is a clear possibility that Loki was impregnated by eating Angrboda’s heart, and thus gave birth to his famous monstrous brood. It is simplest to assume the female Angrboda as the mother, and the male Loki as the father, but we also have evidence to the contrary. There is a bit of confusion on this point, and it seems to be intentional. Angrboda is sometimes called the father, and Loki the mother, and then vice versa. Perhaps this is intended to call attention to the fact that the parentage is different from what is expected. Loki’s androgyny is definitely a theme in many of his myths, and Angrboda’s androgyny is also mentioned at one point (An observer cannot decide if Angrboda is a woman, or a man disguised as a woman). This may be further evidence of their mismatched parental roles. Furthermore, in Helgakvida Hundingsbane I of the Poetic Edda, two characters are teasing one another by comparing one to Loki, and the other to Angrboda. The character comparing himself to Loki says to his Angrboda-like companion that they produced the wolf together, and that he was the father. The Angrboda companion corrects him, saying that Loki is not the true father, and that he was emasculated by giving birth to the wolf. If Loki became pregnant by eating Angrboda’s heart, then it was Angrboda’s seed that fertilised Loki, making Angrboda the true father. So there you go. We don’t know for sure whether the father is Loki or Angrboda, but I believe it was Angrboda, and there is indeed a good deal of support for this idea. There is some more evidence, but it requires a lot more explanation, so I might go into it again once I’ve properly explained Angrboda on this blog.